This sky map shows how Jupiter and the moon will appear together overnight on Aug. 19 and 20, 2011 in the eastern night sky as viewed from mid-northern latitudes. At New York’s Hayden Planetarium, where I’ve spent the last 25 years serving in the role as an associate and guest Lecturer, we’ve been getting an increasing number of phone calls making basically the same inquiry. A typical call goes something like this: "I was out around midnight last night and could not help but notice a brilliant silvery star glowing low in the east-northeast. It was far brighter than any star and I was just curious to know what I was looking at." The object in question is the largest planet in our solar system: Jupiter. It’s a welcome sight, rising in the late evening and coming up above the east-northeast horizon this week by 10:30 p.m. local daylight time. And late tonight (Aug. 19), right on into the early morning hours of Saturday, Jupiter will have company. Hovering about 5 degrees almost directly above the planet will be the waning gibbous moon (your clenched fist held at arm’s length measures roughly 10 degrees; so the moon will appear about a "half fist" above Jupiter during the overnight hours of Friday/Saturday). 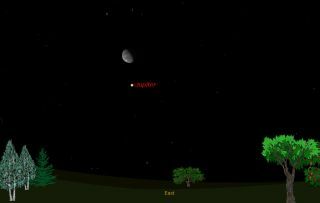 The sky map for Jupiter and the moon shows how the two celestial objects will appear together tonight. Jupiter will continue to rise earlier as Earth’s motion around the sun carries us toward opposition with the giant planet in late October. At that point we will fly between Jupiter and the sun and they will be on opposite sides of the sky. So until then, Jupiter will appear to brighten even more, because the distance between it and Earth is steadily decreasing. Currently, the planet is 38 light-minutes from Earth, but this is destined to shrink to only 33 light-minutes by mid-autumn. Keep in mind that when you look at the moon relative to Jupiter, that our natural satellite is only about 1.5 light-seconds from us — or more than 1,500 times closer to Earth than Jupiter. Note too, that Jupiter is getting brighter and also looking great in telescopes now, though to see it at nearly its highest and steadiest this week, the best time to look is during morning twilight, about 60 to 90 minutes before sunrise. And I'm sure that should sky be clear late Friday night that come next Monday I'm certain to take lots of phone calls from people wanting to know what that "UFO" was below the moon on Friday night and that seemed to follow it across the sky into the early hours of Saturday morning. At least you now know what that "UFO" is!